I don't think I have a favorite book, there are sooo many good books out there! If I were to have a favorite it would probably be Galax, a book I read a million times as a child, but I can't seem to find it anywhere now. I don't remember the author so finding it has not been easy, but I'll keep trying! 2. What's your secret hobby or interest? Do they have to be secret? haha. I like drawing, but I rarely show my drawings so that's probably as close to "secret" as I get with a hobby. 3. If you had to pick one color of eyeshadow for the rest of your life, what would it be? 4. What's your favorite candy? My favorite candy is salt licorice, YUM! Oh I looove my heels! 6. What would your perfect date be like? I started blogging in school out of pure boredom. Then it just stuck I guess, I liked sharing my photos and opinions. Now I haven't been very active in a while tho, but maybe the fun will come back! 8. How large is your family? Any brothers or sisters? I have one sister 26 y/o and two brothers 17 y/o and 24 y/o. 9. All time favorite store? If I have to pick a favorite store I think it must be Shock, I just wish I had more money so I could buy everything from them and change my entire closet to feel more like me! 10. Have you traveled to other countries? If so, which one is your favorite? 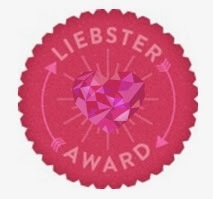 I would like to nominate the following blogs for the Liebster Award! 1. Name one thing you can't live without. 2. What is your life long dream? 3. Do you have a good relationship with your family? 4. Wild party or dinner with friends? 5. What is your best and worst quality? 6. Are you happy with your life right now? 7. Tell us something that most people don't know about you? 8. What is your favorite breakfast? 9. If you could only eat one thing for the rest of your life, what would you choose? 10. Who do you think is the most beautiful person in the world? 11. What's your favorite movie? Hahah oh dear, numbers aren´t my strong point :') can´t even count to 11.. I loved reading your answers! :D Such a fun ay to get to know others a bit more.